Beautytiptoday.com: Cheap Super Quality Christmas Stocking Stuffer! $9.95!! Cheap Super Quality Christmas Stocking Stuffer! $9.95!! If you're like many of us, sometimes you're just stumped as to what to buy for adorable Christmas stocking stuffers or holiday gifts for the special, fun-loving gals in your life. We were bleary-eyed and yawning, as we sat surfing the web until around 1 AM today. We stumbled on to the HomeWetBar website. And when we saw this little, pink number, we were hooked! 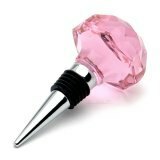 Check out the Pretty in Pink Crystal Bottle Stopper ($9.95). This is a super stocking stuffer that sparkles for the ladies. And you can't beat the cheap price---under $10!! 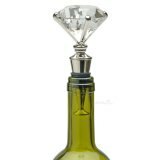 We also found a Diamonds are a Girl's Best Friend Wine Stopper ($12.95). Again, a low price for a quality, elegant gift. These stoppers are great conversation pieces. And best of all, these rock-hard wine stoppers feature a stainless steel shaft and rubber gasket for a tight seal. Hey, we're trying to use our imagination and be a creative, little elf here. It's not easy. This is an unique, cool gift, even if you don't drink wine. It could easily act as a stopper in other bottles. GREAT XMAS presents for my best girlfriends!